To read part two of this study, click here. One year after a major tax bill was signed into law, many Americans are still unclear about whether or how the changes could affect them personally. This uncertainty comes despite many changes having already been implemented. Sentiment about the Tax Cuts and Jobs Act — which ushered in the most significant changes in the federal tax code in more than 30 years — is all over the map, according to a series of surveys commissioned by NerdWallet and conducted online by The Harris Poll. We first asked taxpayers about the law shortly after it was signed in December 2017, for the 2018 Tax Study, and checked in again in December 2018. Americans are largely uninformed about tax changes. As taxpayers await their W-2 statements for tax year 2018, more than one-quarter of Americans (28%) are unsure of what exactly changed with the passage of the Tax Cuts and Jobs Act of 2017, and about half (48%) don’t understand how it affects their tax bracket. Economic outlook is mixed. More Americans say the tax law is good for the short-term U.S. economy (45%) versus bad (26%). But for the long-term economy, more Americans say the law is bad (43%) versus good (28%). Three in 10 (30%) aren’t sure either way. Optimism is highest among Republicans. About half (51%) of Republicans say the tax law is good for both the short- and long-term U.S. economy, versus 21% of independents and 5% of Democrats. Some may have missed a bump in their paychecks. Despite employers beginning to withhold less in taxes under the new law, just 31% of Americans who received a paycheck in 2018 noticed any increase in their pay due to the new tax law. Last January, the Treasury Department estimated 90% of employees would see more take-home pay. One-third cite “no change” in their financial situation. About one-third (34%) say the new tax law has made no change in their financial situation. About one-quarter (24%) say it has improved their financial situation and 22% say it has made theirs worse. It’s not surprising that many Americans are confused about the new tax law. The tax rules — and this new tax law in particular — are really complex and difficult to understand. With the passage of time, the Tax Cuts and Jobs Act is no longer top-of-mind, despite this being the first year taxpayers will see changes when they file income tax returns. In mid-December 2018, only half (51%) of Americans were aware a tax bill was signed into law in 2017, compared with three-fourths (74%) who knew of the new law when asked in January 2018, soon after its signing. When asked what exactly the tax law changed, 28% of Americans said they are unsure. That’s compared with one-fourth (25%) who were unsure last January. About half (48%) don’t understand how the law affects their tax bracket, a number relatively unchanged over the past year (50% in January). This confusion was apparent when Americans were asked whether they think the tax law is good or bad for the U.S. economy — 30% are unsure. Those who have an opinion may believe any positive impact of the tax legislation is fleeting: 45% of Americans think the tax law is good for the economy in the short term, compared with 26% who say it is bad. In the long term, however, just 28% say the law is good for the economy, versus 43% who say it is bad. This sentiment is relatively unchanged from January 2018 when we asked the same question (short-term: 43% good and 27% bad; long-term: 25% good and 45% bad). 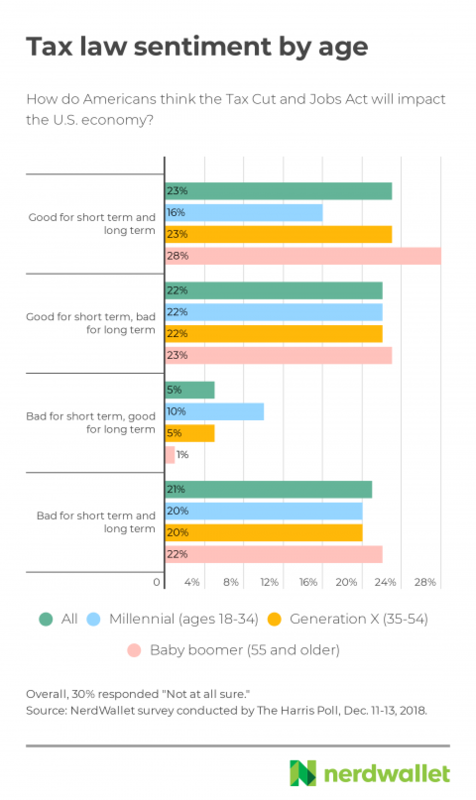 A larger proportion of older Americans say the law is good for both the short and long term compared with younger Americans. But the rate of those saying it was bad for both the short and long term was relatively even across generations. We asked respondents for their political affiliation and found optimism highest among Republicans. More than half (51%) of Americans identifying as Republican say the new law is good for the economy, both short and long term, versus 21% of independents and 5% of Democrats. Click here to see full results by political affiliation. Most employed Americans — a projected 90% of them — were due to see a modest bump in their paychecks around the end of February. That’s because the law changed how much employers withhold in taxes. But few noticed the change, according to the survey. Less than one-third (31%) of Americans who received a paycheck in 2018 say they noticed an increase in their pay due to the tax law. Republicans were most likely to notice a bump — 45% said they saw an increase, compared with 32% of independents and 24% of Democrats. This may be why 46% of Republicans say the tax law has made their financial situation better, versus 22% of independents and 11% of Democrats. Overall, less than a quarter (24%) of Americans say it has improved their financial situation — 22% say it has made things worse and 34% say it’s made no difference at all. As such, few said their discretionary spending increased because of the tax law. Nearly 6 in 10 (59%) said their spending did not change. Just 11% said they spent more on things like dining out, shopping and entertainment. Data from the federal government showed a increase in spending early in the second quarter of 2018, but spending changes followed a similar trajectory in the four previous years, so it’s difficult to connect the peak to the tax law changes. Likewise, a jump in the personal savings rate in the early months of 2018 could be seen as evidence taxpayers were able to set aside more money after the tax bill was signed into law. However, there was a similar high point in the first months of 2015, 2016 and 2017. For some, the change in taxes withheld from each paycheck could put them at risk of overpaying or underpaying, something they likely won’t realize until it’s time to file their tax return. Overpaying results in a bigger refund, but essentially means you’re giving the government an interest-free loan. Underpaying leaves you with a tax bill. The IRS recommends people fill out a new W-4 each year or when their personal situation changes. A W-4 is the form that tells employers how much of your paycheck to hold out for taxes. “While we all tend to ignore the W-4 form, it can have an outsize effect on our financial situation. That’s especially true this year because of all the tax law changes,” Coombes says. “The worrisome thing is that some folks may get hit with a bigger-than-expected tax bill this year — use a tax estimate calculator now, so you can prepare for that bill if necessary,” she says. Only 16% of Americans changed their federal tax withholding within the past year as a result of the new tax law, according to the survey. The youngest were most likely to make an adjustment — 28% of millennials changed their federal tax withholding versus 15% of Generation X and 9% of baby boomers. While it’s too late to do anything about the amount withheld in 2018, taxpayers can use a withholding calculator to see if adjustments are needed for the 2019 tax year. Americans anticipating a federal income tax refund on their 2018 taxes say they expect to receive $1,861, on average. That’s roughly $680 less than the average individual federal refund in fiscal year 2017, according to IRS data. It could be that they’re being cautious with their optimism. Just 17% of those planning to file 2018 returns expect to get more money back for their federal refund than they would have gotten had the new tax law not been passed, according to our survey. Nearly one-fourth (23%) say they’re expecting less. But many taxpayers will see most of the benefits of the tax law at refund time, according to an analysis by Wells Fargo Securities’ research team. According to its estimates, those who earn the least will see the biggest gain in their tax refunds this year. Still, 39% of those filing who earn less than $50,000 think they’ll get the same or less back this year than they would have without the new tax law, according to our survey. Income tax refunds are an annual windfall for some families, and those expecting a refund generally have plans for the taxes they overpaid throughout the year. But those plans may not involve running out to buy the newest flat-screen television; just 11% of those expecting a federal refund plan to treat themselves to a gift they wouldn’t have otherwise purchased. 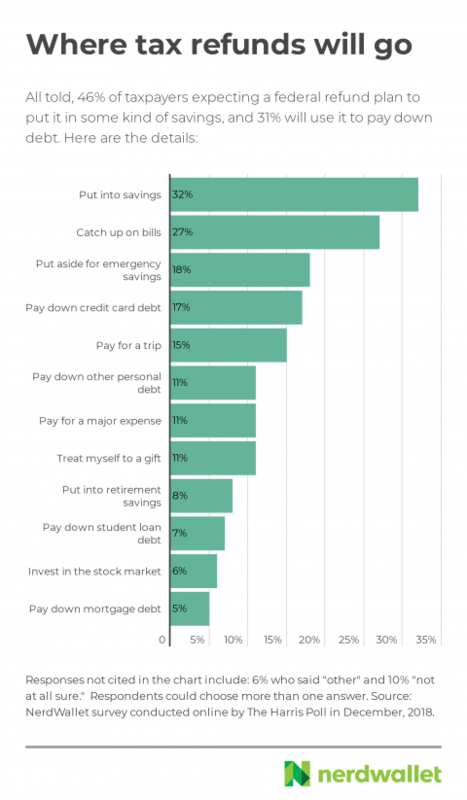 Saving, paying down debt and catching up on bills are far more popular. » Looking to invest your refund? See NerdWallet’s best online brokers for 2019. Seed an emergency fund. Ideally, you have a few months of living expenses set aside for unexpected expenses. But even a $500 income tax refund creates a good buffer if you don’t already have an emergency fund. Pay down high-interest debt. Income tax refunds are a good way to tackle high-interest credit cards and other costly debts, especially if you’re otherwise only making small payments. Grow your money. While nearly one-third (32%) of those expecting a federal refund say they’ll put it “into savings,” the type of savings you use can make a big difference. Putting $1,861 — the average amount folks are expecting in this year’s refund — into a traditional savings account would earn about $34 over 20 years, assuming 0.09% interest, the current average among these account types. Putting that same refund into a high-interest savings account, one that earns 2%, would grow $914 in 20 years. Invest in retirement. The money you save is easily accessible in a savings account, but if you don’t need that money in the next five years, you can see even greater returns by investing. An IRA opened with $1,861 could grow to $5,969 in 20 years, assuming a 6% average rate of return — and more, if you continue to add to the account. Click here to read part two of this study, published on April 2, 2019. 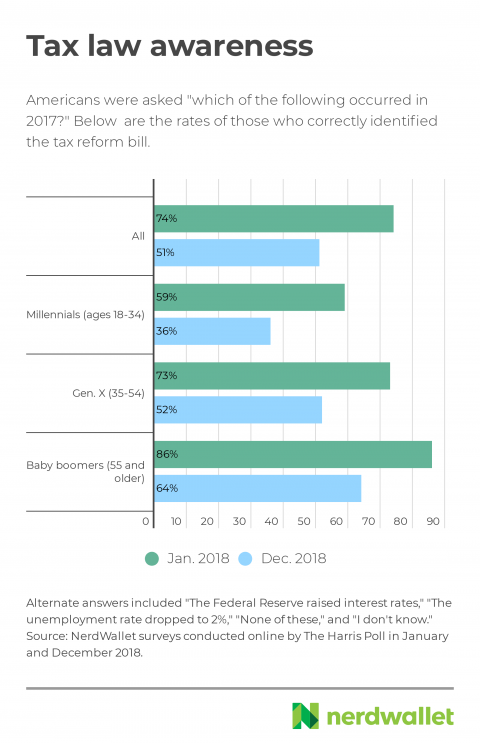 The latest tax law survey was conducted online within the United States by The Harris Poll on behalf of NerdWallet from Dec. 11-13, 2018, among 2,005 U.S. adults ages 18 and older. The earlier tax law survey was conducted online within the United States by The Harris Poll on behalf of NerdWallet from Jan. 9-11, 2018, among 2,086 U.S. adults ages 18 and older. These online surveys are not based on a probability sample and therefore no estimate of theoretical sampling error can be calculated. For complete survey methodology, including weighting variables and subgroup sample sizes, please contact Megan Katz at mkatz@nerdwallet.com. For all surveys referenced, generations are defined as: millennials, ages 18-34; Generation X, ages 35-54; and baby boomers, ages 55 and older. Interest earned on savings accounts deposits was calculated using 0.09% interest for a traditional savings account versus 2% on a high-interest account. Returns on an initial IRA investment of $1,861 were calculated using no additional contributions, a 20-year period and a 6% average rate of return.